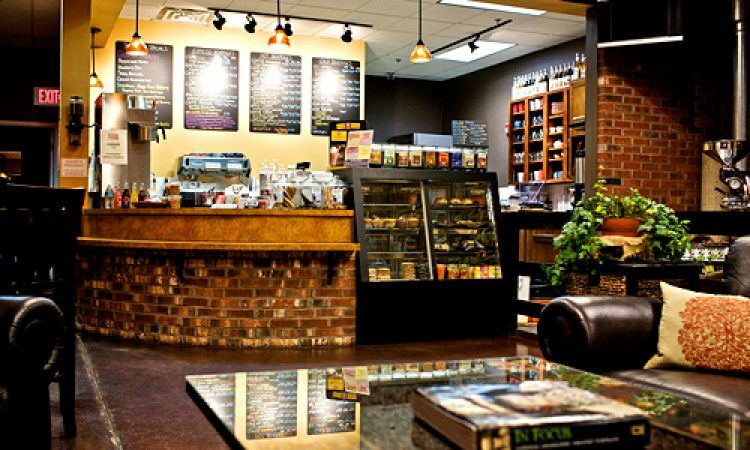 While reading the “About Us” page on the website of Burlap and Bean, an independent coffee house in Newtown Square, I found it interesting that the owners chose to focus more on the atmosphere of the establishment than on the coffee itself. Not because the atmosphere isn’t great — but because the coffee is that good. I’d go out of my way for coffee this fresh and boldly-flavored if it was served in a warehouse. B&B serves only Fair Trade, Organic coffee, all roasted right in the front of the store. You will not find fresher coffee! If you happen to be there during a roast, ask for some right out of the roaster. The pungent aroma of coffee that is this fresh is amazingly different from anything you might find at a supermarket — or even a national chain that claims to serve fresh coffee. Even if they aren’t roasting when you’re there, 1lb bags are always available to go in the back of the store. The roasting date is written on the bottom – but they’re usually all less than a week old. The shop itself sells all the regular coffee drinks one would expect. I happen to prefer espresso, and B&B has the finest one I’ve tried in the area – it is rich and intense without that burnt flavor one so often finds. It’d surely be great with some foamy milk on top as well – in fact, any of their coffee drinks are sure to be fresh and tasty. They also have a large selection of organic loose-leaf teas. B&B’s focus is coffee, so they leave the food to others. Baked goods are brought in from 110st Bakery, Wayne’s Aux Petits Delices, Handcrafted Cookie Co., Sinfully Delicious, and more. For more hearty fare, they offer a couple Kettle Cuisine soups, wraps from Media’s House Café, and some other munchies. As mentioned above, Burlap and Bean’s owners take their atmosphere very seriously — and it shows. The room is very welcoming and nicely designed, with soothing colors and exposed brick. There is ample comfortable seating, and in contrast to the spartan insides of most Starbucks these days, this truly does seem like a place where one could hang all afternoon. In addition, they have Live Music Thursday (Open Mic), Friday and Saturday nights. A schedule is available on their website. NOTE: The photo at the top of this post was taken by Jeff Wojtaszek.